Jam packed with fruit in a variety of colours. 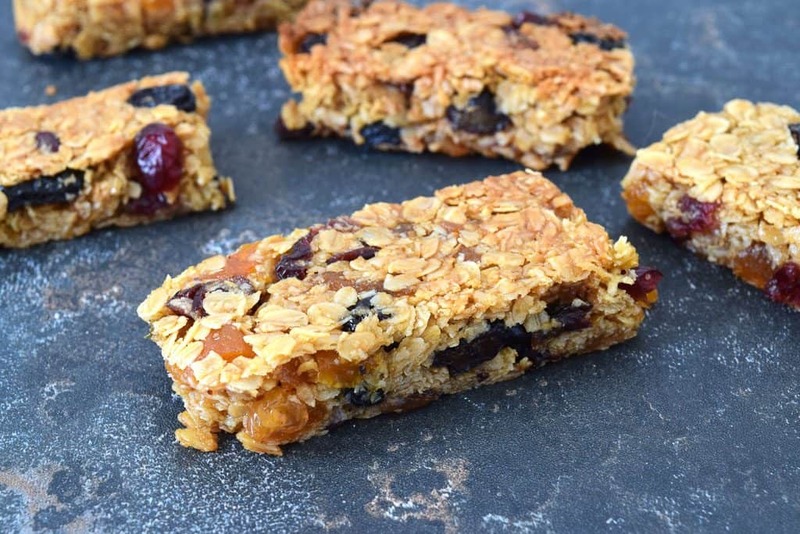 These delicious fruity jewelled flapjacks are guaranteed to have everyone returning for a second…. or a third! I couldn’t stay away from the kitchen completely. For starters, we’d starve and secondly, spending time in the kitchen, for me, is quite calming. I can get lost in daydreams when I bake. So, for my return, I decided to create a simple but totally fantastic flapjack filled with colour and flavour. The boys were pretty happy with these and I even managed to make extra for my friends too. 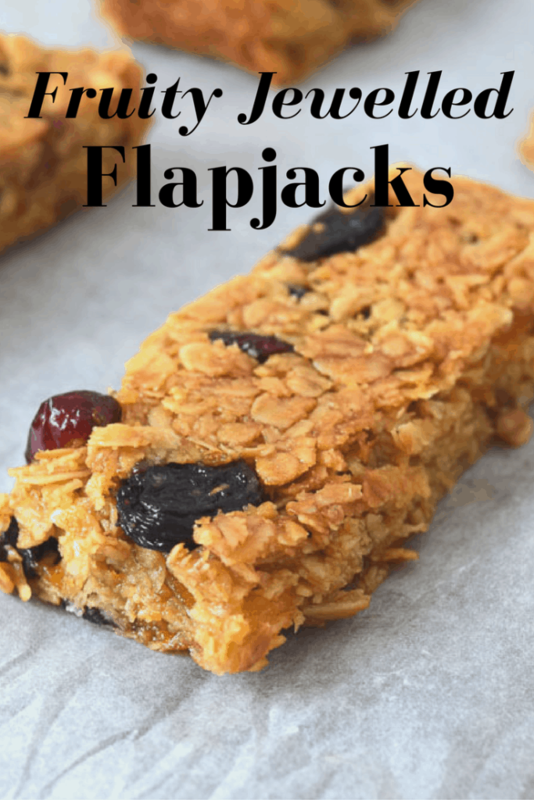 Flapjacks bring back memories of my nan. We found a hand written recipe for her flapjacks tucked inside the pages of her Mrs Beeton cookbook. Mrs Beeton is one of the first cookbooks I ever laid eyes on. I used to search the pages for something delicious to replicate back when I first became interested in cooking. There are some recipes amongst them that you couldn’t imagine serving in today’s family kitchens. But I do see a lot of history in the pages of that book. It says a lot about how families used to live and what they ate. I imagine plenty of households had their own copy of Mrs Beeton’s cookbook on the shelf. 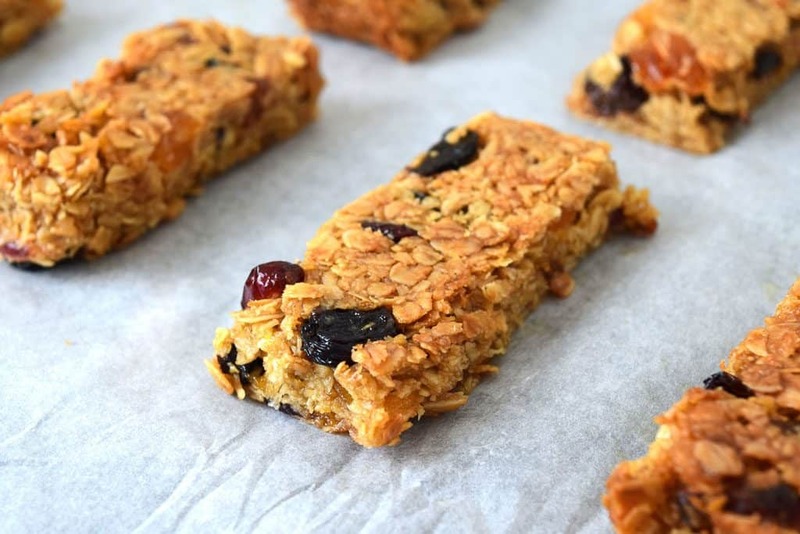 Whilst plain flapjacks certainly have their place as a delicious treat, these have a different texture. They are a little more crumbly, a little more chewy and a little more colourful. I wonder what Mrs Beeton or my Nan would have thought of them? They probably would have been quite the luxury since the fruity ingredients wouldn’t have been so readily available. Isn’t it incredible that kitchens were so very different only a short time ago. Why Not Try Another Treat? If you have some apricots left over try this Cinnamon Apricot Biscotti Recipe Now. Place the sugar, butter and syrup in a saucepan and heat gently until melted and combined. 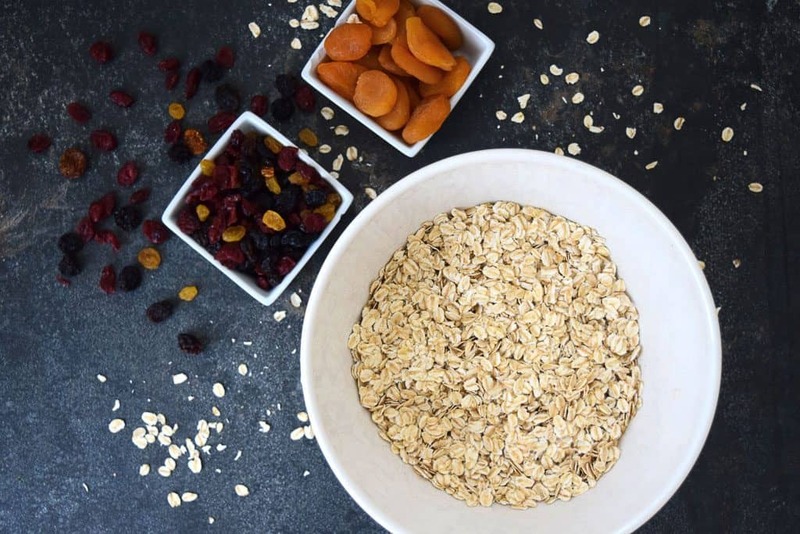 Roughly chop the apricots into chunks and mix into the oats along with the berries. 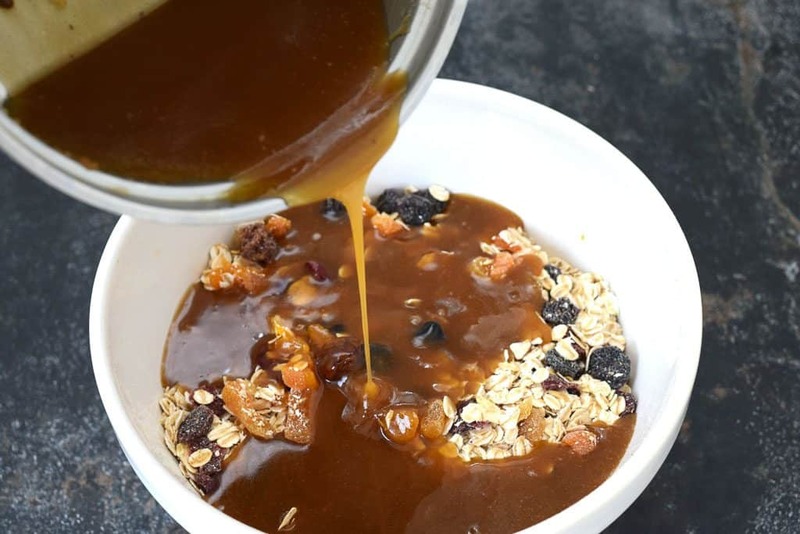 Add the melted ingredients to the oats and mix until everything is incorporated. Line a 23cm square tin with greased baking paper. Pour the mixture into the tin and press down firmly with a spatula to ensure there are no gaps in the mixture. Place in a preheated oven at 180oc (160oc fan assisted) for 20 minutes until golden. 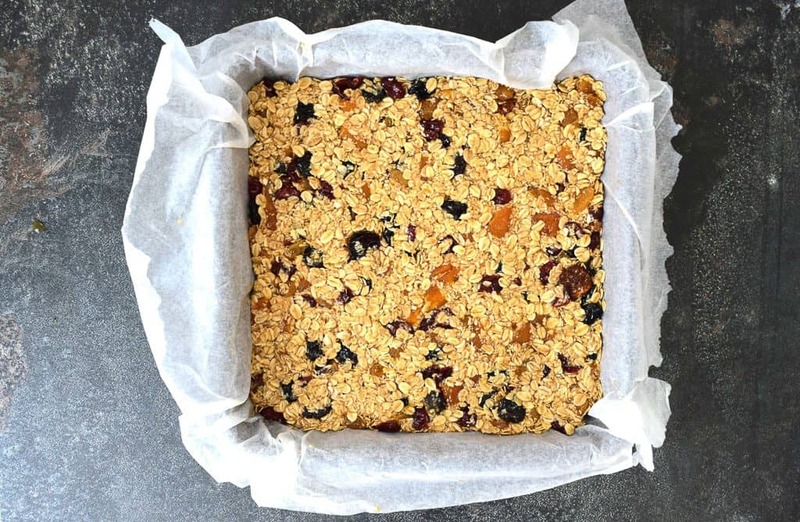 Take out of the oven, press the flapjack down again if it has risen in any areas and allow to cool completely in the tin. 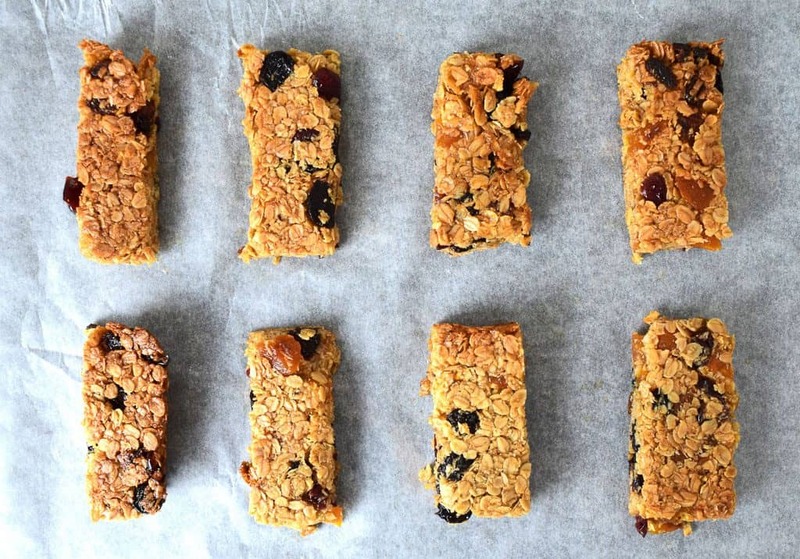 Once cooled, cut the flapjack into rectangles.